Are you longing for a place where you can deepen your relationship with your own body, heart, mind and soul? …a place where you can show up exactly as you are and be supported by a group of women? …a place where you can dance your heart out and express all the different aspects of yourself without judgement? Join us for a ongoing journey of self-discovery. In these classes we will explore how to be more present and embodied in all aspects of your life ~ physically, emotionally and spiritually. Through the Open Floor Movement Practice, inquiry and experiential exercises, we move and include everything that arises, on and off the dance floor. What better way than to dive in than with the support of a dedicated group of women each week. Each class is tailored to provide what will benefit the group. Every woman counts. Women of all ages, shapes, and sizes are welcome. No previous experience necessary. The world needs us women to gather together, dance, connect, heal, and laugh (yes...we will have fun!). Make this essential investment in your own well-being. 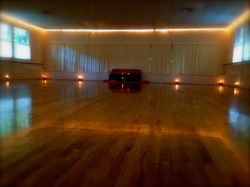 To learn more about the Open Floor Movement Practice, CLICK HERE. "I have just finished Stacey's 6 week Women in Motion Series and I really recommend it. I was looking for somewhere to dance where I could feel safe and drop some of my self-consciousness without a couple of drinks, and I found so much more than that. It was definitely fun, and liberating, and great exercise, but I wasn't expecting to experience so much mindfulness and clarity, particularly around emotions and my relationship to others and to life in general. Stacey has a warm and gentle style and seems to know how to provide just the right amount of structure so that I felt free to let go. It was also challenging at times, and that was helpful too. I always left the class feeling more energized and positive." Click here to read more testimonials about these series. Each class will build on the last, as we go deeper and deeper together. To create a deep and safe container for all, I ask that you attend all classes if possible and that you are able to arrive on time. We realize that life gets in the way sometimes, so if you need to miss a class or two, please just let me know ahead of time; however, there are no discounts for missed classes.